If the Rockies are a joke, Thursday’s 9-7 matinee loss to the Diamondbacks was the cruelest punchline of the season. The trouble started before many fans could settle into their seats. After retiring the first two batters to start the first, Juan Nicasio walked Justin Upton and Miguel Montero back-to-back. The pitches weren’t particularly close, either, with Nicasio frequently missing very high and well out of the zone. That wildness would be a harbinger of things to come, with the Rox showing off the form that’s made them one of the five walkingest pitching staffs in baseball. The only good news was a momentary absence of bad news: The D-backs didn’t score, and Nicasio dodged a serious bullet. Nine months after breaking his neck on a line drive back up the middle, Nicasio got pegged with another sharp liner, this time by Willie Bloomquist. This time the ball struck him on the thigh; the two walks immediately followed that strike, but Nicasio appeared no worse for wear thereafter. In fact, the Rockies quickly seized control of the game. While Nicasio didn’t make it out of the fifth (after walking five and throwing 106 pitches in 4 2/3 innings) the offense delivered. Tulowitzki, badly hobbled earlier this week after taking a line drive off his leg, looked fine as he blasted a two-run homer in the bottom of the first. A Dexter Fowler RBI triple and Jordan “The Fight Doctor” Pacheco’s third major league homer gave Colorado a 4-1 lead through five. OH MY GOD RUN FOR YOUR LIVES!!! A beekeeper arrived, vacuumed up the bees for relocation, and the matter seemed resolved. Except for the music choice during the beepocalypse. 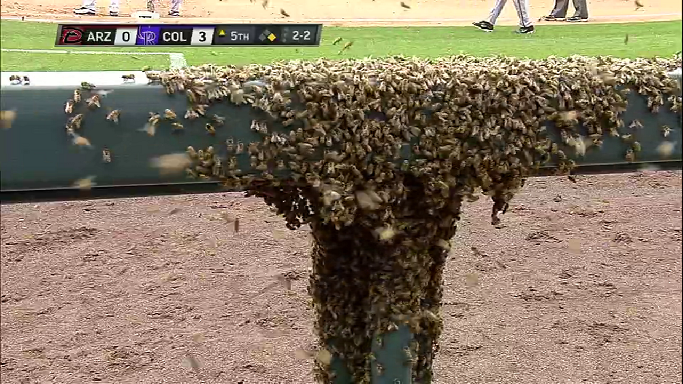 As the last few bees were being collected, the PA system at Coors blared, “Let It Be.” This caused a raging debate for the next two innings in our section. No love for “I’m a Beeliever”? Maybe something from Sting’s catalog? Or even play it straight with “Flight of the Bumblebee”? Once the buzz died down, the Rockies’ wildness continued. Josh Outman and Matt Belisle combined to walk two more Arizona hitters in the sixth, as the Diamondbacks narrowed the lead to 4-2. Then Tyler Colvin ran the Rockies out of an inning by trying to steal third, because when you’re 6-foot-3, 210 pounds, with seven steals in 250 career games, you’re apparently Willie Wilson. Then bad luck started piling up, as Arizona’s second infield hit in as many innings helped push across another run, cutting the lead to 4-3 in the seventh. Then Rex Brothers and Esmil Rogers threw gas on the fire, ceding two walks, a wild pitch, and four singles in the eighth to put the game seemingly out of reach. against two of the lowest-scoring teams in MLB, the Padres and Giants. The Rockies’ defense has compounded the problem of a thin pitching staff, ranking 28th in team UZR. The Rockies weren’t quite done on this day, though. As much as pitchers on both teams struggled, it was clear early on that home plate umpire Jim Reynolds would be calling a postage stamp-size strike zone — and it only got worse as the game went on. Three walks, two singles (one of them an infield single by Jason Giambi), and a Ryan Roberts error fueled a three-run rally to tie the game headed into the ninth. A Justin Upton two-run bomb made it 9-7 and figured to put the Rockies out of their misery. Nope, there was more suffering to come. The Rockies rapped three straight singles against shaky Arizona closer J.J. Putz, loading the bases with nobody out. Jim Tracy gets a lot of criticism for some of his managerial tactics, ranging from destructive bunting to lineup strategies. Today, he burned two players replacing Jonathan Herrera in the eighth, pinch-hitting Jason Giambi, then pinch-running for Giambi with Eric Young Jr. Given the circumstances, these weren’t terrible moves by any means. The Rockies were down three and had a rally going, with a very real chance that the bottom of the eighth could decide the game. If more managers used their best relief pitchers in high-leverage situations as aggressively as Tracy burned his bench in this game, we wouldn’t have to watch 10 shots a game of a forlorn Jonathan Papelbon sitting in the bullpen, looking on in agony as some second-rate middle reliever blows a lead because it wasn’t a save situation. The problem in this case was a universal one, a mistake every team in baseball makes: The Rockies carry 12 pitchers. There’s certainly value in carrying a specialist on the roster, someone who can come in, face one elite lefty hitter in a big spot, and get him out. But relief pitcher outings in general have gotten progressively shorter over the year, to the point where a multi-inning relief stint in a close game is rare. Managers dig deeper into the bullpen every night as a result, and insist on carrying a seventh reliever on the off chance the mop-up man might get pressed into emergency duty in the 14th inning. This obsession with bodies in the pen has shortened benches and left teams in bad spots late in games. Hand spots to a backup catcher and a punchless utility infielder, and you’re left with two half-decent bats at most for an AL team, three for an NL team. Throw in inevitable platoon splits and you’ll rarely see teams find optimal hitter-pitcher matchups in big spots. Alex White, another pitcher. White predictably struck out. Ramon Hernandez hit into a double play. Ballgame. In his column eviscerating the Rockies for their miserable season, Kiszla placed the blame at the feet of general manager Dan O’Dowd. The fourth-longest-tenured GM in the game, O’Dowd has fielded just four winning teams in his 12 years on the job, with another losing season likely this year. Though the farm system has produced stars like Tulowitzki and Matt Holliday, the team has found little success trolling the free-agent market or making impact trades (Carlos Gonzalez being the one very large exception). Tulowitzki is a marquee player, and there’s enough talent in the supporting cast to at least make the team competitive. They’ll get help later this year when top prospect Nolan Arenado comes up to fill the gaping hole at third base, and hope for better health from de la Rosa and Chacin and further development for young lefties Friedrich and Drew Pomeranz. But the Rockies have headed straight down after banking two wild-card berths (and one improbable World Series run) in three seasons. Though much of the blame rests with Coors Field and its maddening quirks, a nine-inning game that features 13 hits and nine walks surrendered by Rockies starters would be remarkable if it weren’t a little too common. It’s not fair to call this team a joke. But right now, there are few teams more painful to watch.